A stunning view of the north-east coastline this morning. 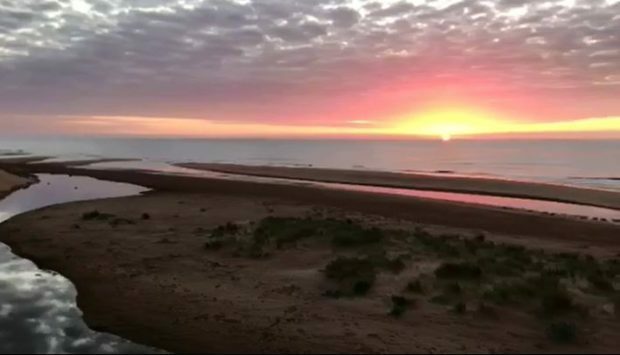 The beautiful sunrise was filmed this morning from Balmedie beach. Lee Fowlie, 43, captured the stunning sunrise of the Aberdeenshire coastline at 6.20am today. Taking time out from his day job, the automation maintenance specialist took out his phone and began filming as the sun dazzled over the popular beach destination. “I do photography as a hobby and like to capture sunrise at Balmedie Beach at least once a trip off with it being my home village,” said Lee. As the seasons change it is hoped the north-east will experience more amazing views like this one. Lee added: “Autumn often brings beautiful sunrises and sunsets as well as the colours in the trees. I’m certainly looking forward to trying to capture it with the camera. “Balmedie is a beautiful spot, either up at the top of the sand dunes or down on the shore when the tide is out and the amazing patterns it leaves behind in the sand. You can find more of Lee’s photographs on his website and Facebook page.